Its not only a costume! On behalf of the friend I ordered it for, she loves it! B.t.w. also fast shipping, from he US to Europe in 5 days with standard shipping, awesome! Was this review helpful to you?YesNo13 people thought so and 1 didn't. Being a bigger plus size it's really hard to find costumes so I'm really glad I found this. It's super comfy and warm and sooo cute. I typically wear a 22 pant and 26/28 top. I ordered a 5x and it fit perfectly. I can't wait to wear this for Halloween! Was this review helpful to you?YesNo9 people thought so and 1 didn't. also in the bigger sizes best to get one extra (smaller than what indicated as measurements). but nice and comfy, real pretty. It's a jacket. A thick felt/fleece jacket with web arms and ears on the hoodie with faux fur. I paired it with fishnet spider stockings and black wedge ankle booties. I was attending an indoor party so I opted to wear a black bodysuit and shorts underneath so I could unzip to cool off and be covered. It was easy and didn't require a lot of thought and preparation...perfect. First, i'm thoroughly impressed with the shipping costs with this website. I would expect that so close to Halloween, (which is when I ordered it) that I'd have to pay an arm and a leg. It fit wonderfully and will be used outside of halloween. A little tip though, as im sure many reviews of this hoodie/dress have said, it does run small, so go a size above what you usually get. While I would like to give this a higher rating, this costume arrived with a large hole in the arm of the costume. I did not have time to send it back, so I mended the hike and wore the costume. The costume was very warm (fleece like material) and fit perfectly. I am very glad that I read the recipe that urged me to order up in size, I followed that advice and it fit perfectly! I love this! Its so very soft and cuddly. Its not scratchy, its a nice thick fleece, like wearing a blanket. The only reason I didnt give this 5 stars is because the sizing guide is so off. My chest is 44 inches, waist 40 and hips 42. I ordered a 3x/4x because reviews urged me to size up and I'm glad I did! This fits snug. 3x 4x is supposed to be 46 inches at the chest but while it isn't super tight, Im not able to wear a pushup bra without it squashing me down. It is also tight across my hips, again it's supposed to be looser. 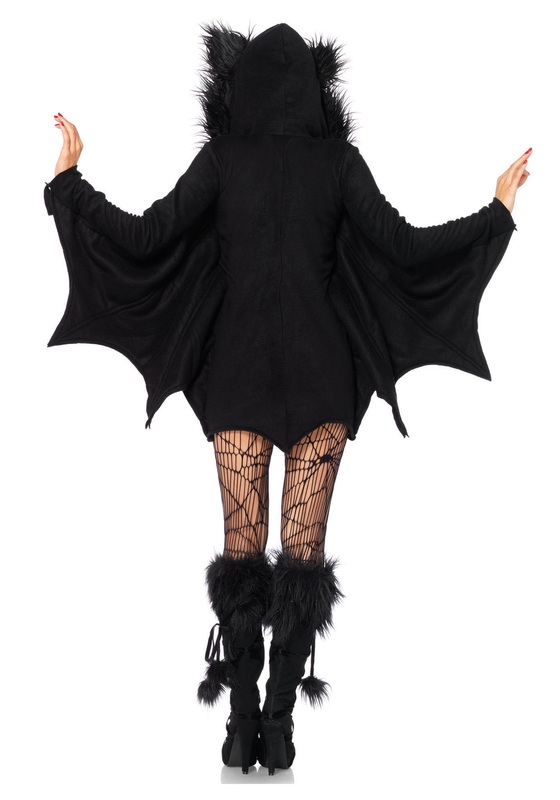 Im 5'1 and this hits me midthigh when I wear it, which is perfect for me to pair with plush lined leggings for taking my toddler trick or treating in the cold weather here. Im happy with the costume, but I do wish it was true to size so I could wear warmimg layers underneath without it looking weird. The material this is made out of must be a heavy fleece. It is very warm. I got the 1X/2X - and in regular clothes wear a 14. This size fit me well - not too big, not too tight! It's like a long zip up hoodie (for some reason I thought it would be more like a 'shorts romper' when looking at the online pics, but it isn't). I feel good in it.